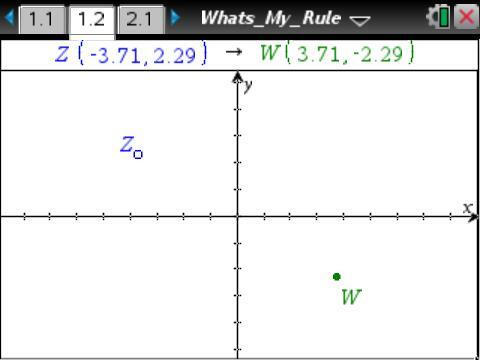 In What’s My Rule, students move point Z and observe how W follows. 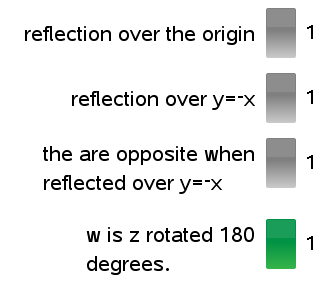 Z is mapped to W according to some rule that the students are trying to determine. There are all sorts of great questions to ask with an activity like this. 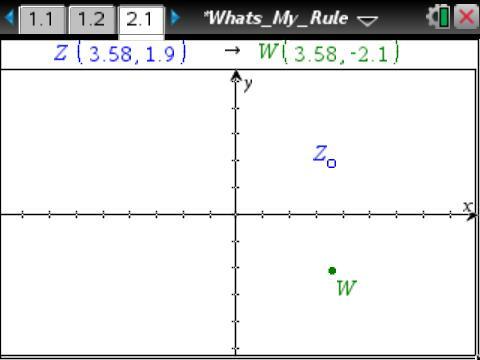 After moving Z for a few seconds, I ask “Can Z and W ever coincide?” And then, of course, someone has to tell the class what coincide means in terms of points. If I move Z to Quadrant I, then where will W go? If I want W to be in Quadrant II, then where must I put Z? 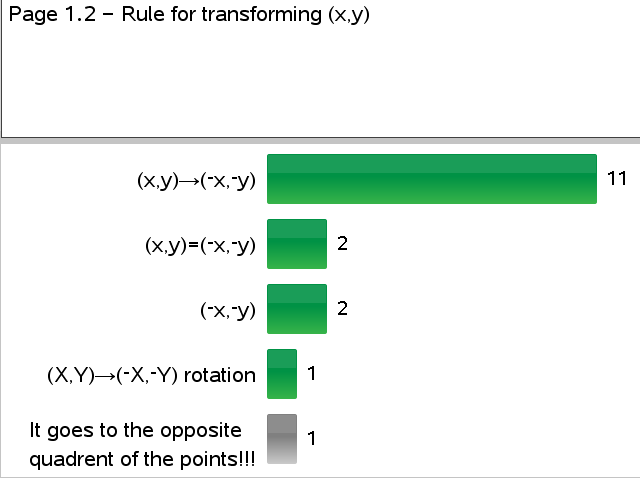 I sent a Quick Poll to get student responses for the rule. 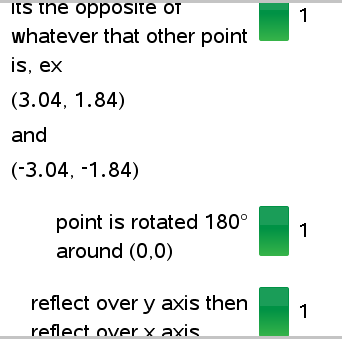 Students entered the mathematical practice of attending to precision. Students entered into the mathematical practice of constructing viable arguments and critiquing the reasoning of others. Students entered into the mathematical practice of reasoning abstractly and quantitatively. 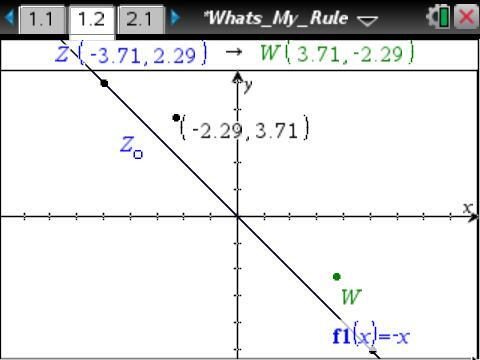 We went back to the TNS document and showed why Z was not always the image of W reflected about the line y=-x. We also showed what happens when we require Z to be on the function y=x^3 (I’ll eventually learn how to do LaTex…) and origin symmetry. There are 7 transformations for students to explore in What’s My Rule. I could write an entry about each one. But instead, I’ll just share one more snippet. 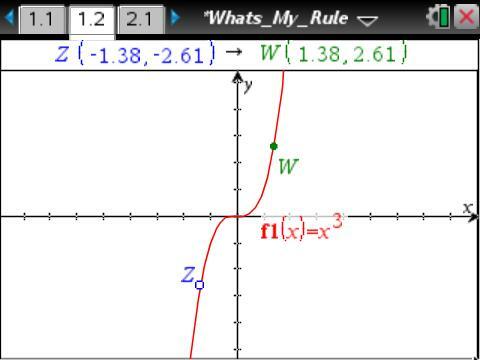 In this problem, Z gets mapped to W through a translation with the rule (x,y)→(x,y-4). One question I asked was where Z would be if W was in Quadrant IV. 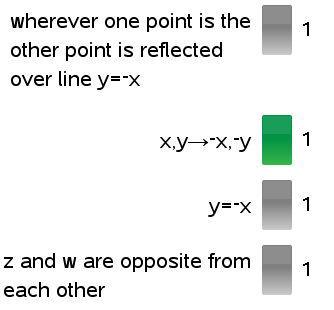 Obviously, Z can be in Quadrant I. Can it be anywhere else? Someone suggested that Z could be in Quadrant IV. 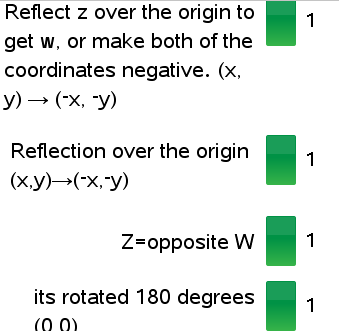 So Z can be in Quadrant I or Quadrant IV. Can it be anywhere else? After a while (a long while…I had to wait, easing my hurry syndrome), someone suggested that it could be on the positive side of the x-axis. And so, the journey continues….